Do you have teeth missing and think about improving your smile? Dental implants can be an inspiring solution for you. 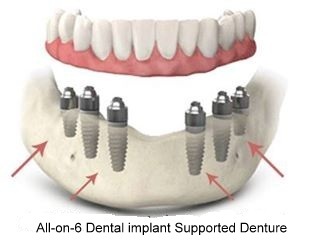 If you have been missing teeth or wearing dentures for a long time and think that you will not be able to get dental implants because of bone loss, then we can offer you All-on-4(All-on-6) dental implant supported dentures. In this case, we will use specially angled implants to support the crowns that replace missing teeth. If you have no teeth, we will offer 8 (12) implants for full teeth replacement with All-on-4 (All-on-6)dental implant supported dentures. Implants will be placed at an angle and will securely support the full dental denture.The angle position of these implants makes them more stable and allows them to fuse to the bone nearer to the front without affecting any vital structures. 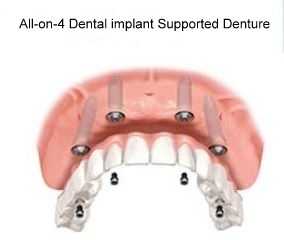 All-on-4 (All-on-6) dental implant supported dentures can be an ideal solution for people who have been without teeth for several years and as result have lost too much bone to be able to get regular implants. All-on-4 (All-on-6) dental implant supported dentures require less bone than regular dental implants and can bring your smile back. If you think about having All-on-4 (All-on-6) dental implant supported dentures, a proper assessment to discuss your case and your health condition is the first step. Our Specialist Implantologist will give you an examination and ask you questions about your health and lifestyle to determine if you are a good candidate for All-on-4( All-on-6) as some people with certain medical conditions like diabetes ( if they do not keep sugar level under control) may not be good candidates for any type of dental implants. If you are a smoker and do not have a good oral hygiene, the chance of implant failure is greater. Contact Modern Dental Care now to set up a consultation to talk about All-on-4 Implants.